The 150 XT is a low-maintenance air dehumidifier. No water tank has to be emptied with this device since the moist air is guided outdoors by a hose. The Combi 150 is an adsorption dryer + turbine in one. It has been built especially for use in inhabited rooms where the noise level has to be very low and a simple, fast and easily controlled installation is needed. Ideal for drying wash floors and cavities! 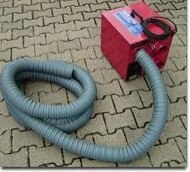 Can be operated in both suction and pressure mode. Very quiet! The complete thermal energy is transmitted to the drying air! The Combi 150 suction method with Hepa filter insert is ideal for damage caused by water with mould. Our vertical radiator heaters are ideal for the specific spot heating or drying of wet walls and floors. Our silent infrared collectors (IRK 200 + 500) are maintenance-free and environment-friendly. No oxygen is consumed to produce the heat and the low energy consumption raises no dust. The devices are standalone or wall-mounted and can be used singly or connected to form larger areas.